As I started along the mown trail, I spied someone descending the hill. We greeted each other when we met, and I told him that this was my first time at Hollow Fields. With a smile, he told me this was a perfect short hike – one mile up the hill to work the body, one mile down the hill to enjoy a view that nourishes the soul. “It’s a place you can keep coming back to,” he said, “to touch base with yourself and get straight with the world.” And with that, we went our separate ways. Now, I’m not saying that this guy was for sure a leprechaun, but I will admit that I’m not 100 percent certain he was not a leprechaun. Because ahead of me was the equivalent of a pot of gold. A moderately steep ascent through a cleared field takes you up to a plateau that leads to a wooded trail. Sheltered by trees, the trail then rises steadily uphill until it starts to loop back, making the turn the apex of the walk atop a second cleared field. 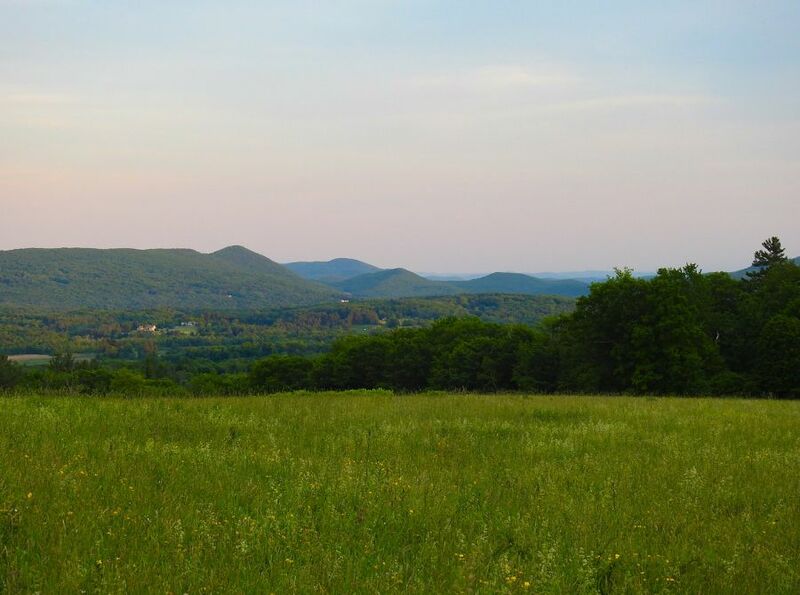 The view from that spot is a miracle – an open vista that takes in the Berkshire Hills stretching southeast into the distance. Gravity carries you effortlessly down through the upper field and into another short wooded stretch, and then back to the main path, which overlooks the entirety of Yokun Ridge until nearly the end of the walk. Since that first experience, I’ve returned to Hollow Fields almost daily to get straight with the world, just like that leprau…I mean, that kind gentlemen, suggested. I found my fitness here. I recovered my balance here. I saw the autumn leaves turn red and gold and then fall, and I returned throughout a frigid, snowy winter, snowshoeing to the top and bounding down through soft snow that sparkled in the sunlight while “Marshmallow World” (the Darlene Love version) played in my head. As I write now, it’s early summer, with the grass in the fields waist-high and home to nesting bobolinks and swallows, and the woods green with a high canopy of leaves and a carpeting of ferns. I look forward to seeing it all change again. I like to think of Hollow Fields as a “tasting menu” of all the other hikes you’ll find in the Berkshires – you get a little bit of everything in a manageable 60-minute jaunt suitable for most fitness levels, and you won’t be disappointed if you decide you only want to go part of the way. It’s even nice if you just park your car and sit on the bench near the trailhead. And while I can’t promise that you’ll encounter a leprechaun, I hope you’ll say hello if our paths cross. The BNRC has tapped me to be the trail steward volunteer for Hollow Fields, a role I’ve gladly taken on in order to pitch in and preserve this special spot for posterity. Please come and enjoy, and please support – by volunteering or with a generous gift – the BNRC’s worthy efforts to sustain the natural treasures of our Berkshires.